ABS plastic bindings are used by Gibson, Martin, Taylor, Fender and many other manufacturers. The material adheres well to wood and to itself. Our ABS plastic bindings are 65" long — a single piece will reach completely around a guitar body. These bindings are manufactured with smooth edges, not rough-sawn from sheets, for closer size tolerances. #5792 extra-tall .565" binding is the right size for Les Paul® and similar guitar tops. You can sandwich strips together using our Binding Laminator and acetone. Measure carefully before you rout the channels, and almost any combination can be installed. 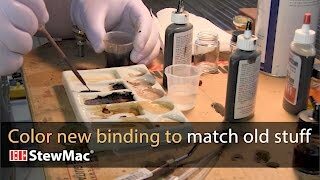 For easy binding installation, we recommend StewMac Bind-ALL Guitar Binding Glue. I have always used a solid piece of white-black-white binding for my mandolins. Mitering the corners was never fun and I would usually have some waste. 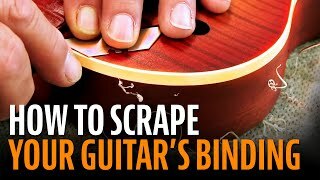 Luckily I saw a video on line where Tom Ellis of Ellis mandolins used individual pieces to build his bindings. I went to Stewmac and bought the sizes i needed and they were at my shop3 days. Perfect, easy install, used Loctite super glue for awesome, easy results. Thanks Stewmac and Tom Ellis! Nice and uniform, but not perfectly flat. 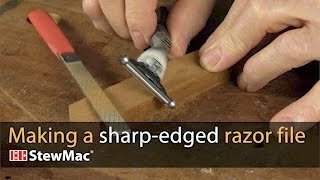 I am using this for edge-binding of a fretboard. One face of it quite flat (I used this as the inner face that was bonded to the fretboard). The other face has a slight curvature to it. I measured this as about .062" thick in the center and about .057" at the edges. Something to be aware of when fitting up. It bonded very well with the Bind-All adhesive. Up here in Canada it's not easy to get tortoise shell celluloid binding . Glues and scrapes nice. Such great quality and as usual you can sit back and relax knowing that this binding material is of great quality knowing It's from Stew Mac. Never have problems with it. Great products and super shipping. They've got it all. It does what black binding is supposed to do. It sits there looking black. Just put this on my telecaster build and it looks great. Happy with the results.